Below is the reflection I shared at Joseph’s memorial service last week at St. Andrew’s (with a few tiny revisions). Joseph Michael F.K.. A name that was held in hope for a long time. Before we knew we would be living in Egypt. Before we knew we would have a son. Even before we decided to start a family, we had chosen this name. Joseph—a family name, Justin’s grandfather and cousin; Joanna, the feminine form, his aunt and sister. Our Joseph would be the fourth generation to bear this name. Michael—my father’s name. Each of our last names so that there would be no confusion that we were his parents. Joseph Michael F.K. A big name for a little boy, but one filled with meaning for us. I love that Joseph is the Biblical dreamer. Joseph in Genesis with his dreams of grandeur. Joseph in Matthew with his dreams to reassure him and protect his family, particularly the infant Jesus. And then, when it became clear that our son would be born in Egypt, we loved that this name had so much significance here. Both Josephs, both dreamers, spent time here in Egypt. Many of you know that this pregnancy was not an easy one. We learned fairly early that our first child would be a son when some early tests were recommended after an unusual scan. We would have been happy with a boy or a girl, but as soon as we learned that we would have a son, we dreamed of raising a little boy. We dreamed of him playing at the lake with his cousins, Rocco & Jeffrey. We dreamed of what he would look like, whose features he would have. What would he love to do? These day dreams carried me through the long days of bed rest and filled me with hope in spite of the frustrations that came with things not going perfectly well. I rested and I dreamed, in hope that I would carry this child to term. As we know all to well, though, not all dreams come true. Joseph, our little dreamer, was held for all of his brief life. We were able to kiss him and tell him we loved him. He had Justin’s chin and the beginnings of blonde hair. His tiny little feet and hands held long fingers and long toes. Everything about his tiny body seemed perfect. But something wasn’t right, something happened to make him come so early that his life could not be sustained. Early that morning, as we held our tiny son, we knew that our dreams of this son would die along with him. We don’t know why it happened. Our doctors assure us that it was nothing that we did. We just had bad luck. And, for the most part, it’s awful. We’ve cried more tears than I knew were possible to cry. I wish that I still carried this child inside of me, that he could be healthy, that whatever went wrong wouldn’t have. And yet, in spite of our grief, we have felt support come from all over the globe. You all have been a source of comfort and hope for us, in being here tonight, in your hugs, messages, visits, food, and flowers. Although I feel that so many dreams have been crushed–dreams of an easy pregnancy, dreams of a healthy baby, dreams of raising this son—I have felt God’s presence in the midst of our grief. We cling to Christ’s promise of resurrection. We cling to the promise of a communion of saints. We lean on our friends—on all of you—to remind us that we are not alone in this journey. To remind us that we, and Joseph, are loved. By friends and family around the world. And by a God who loves us all more than we can begin to imagine. After Joseph’s dream, Matthew reports that it all took place to fulfill what had been spoken and that the name of the child would be “Emmanuel,” which means “God with us.” This dreamer, this Joseph, the one who must have held the sleeping Christ child, God-with-us, looked down with love, as so many parents have, at the tiny child in his arms. Surely he dreamed of what this child would grow up to do. Knowing that this one was the one he and his people had been waiting for so long. Little did he know that this child would grow up to suffer and to die, so that we could have life. It is this child, grown up, the one who lived and died and rose, Christ in whose promise I cling in these days darkened by grief. It is in Christ that I now place my hope for Joseph–that in Christ he lives, a member of the great circle of saints, experiencing God’s dream for a world where there is no more pain and suffering, where tears are wiped from eyes and where death is no more. While most dreams for our son will not be, this is the one, God’s dream for God’s kingdom come, that brings us comfort, that refills the hope that was sucked from us as we held our dying son in our arms. As we commend our son to God, we dream of God’s kingdom come, for Joseph, for us, and for all of God’s people of every time and place. Easter is a whole season. I think we forget that sometimes. We celebrate and sing and shout our alleluias on Easter Sunday, with the smells of Easter lilies filling the sanctuary. And then we go back to the grind of daily life and, sometimes, we forget that Easter is not just one Sunday, but a whole season. Fifty days when the resurrection promise is set boldly before us. Because Christ lives, we live. It’s hard to believe that the Easter season is almost over. We’ve been planning the Pentecost service at St. Andrew’s and I’ve seen lots of Facebook posts about brothers and sisters planning theirs in congregations near and far. But we’re still in the Easter season, which is good, since I have yet to write about the Easter Sunday festivities at St. Andrew’s. The day started with a lovely English service. We sang all the Easter favorites, accompanied by organ and surrounded by gorgeous arrangements of white gladiolas, daisies, and Easter lilies. After the service, we feasted with an potluck that reflected our international community. Indonesian noodles, pancit, sushi, Egyptian sweets, potato salad, and corn casserole, just to name a few. It was fun to see what people brought and, of course, even more fun to try dishes from around the world! I loved the way our international community was reflected on the banquet table. It was a delicious and delightful celebration of Christ’s resurrection! The Nuer congregation’s tradition is to baptize on Christmas and Easter. They had invited me to be a part of the Easter Sunday baptisms so after I had eaten and visited, I headed back into the sanctuary for the second service of the day. When I arrived, they were calling the names of those who would be baptized and they gathered around the font, some holding hands of parents, others held in their arms, still others playing or standing obediently next to their moms. With eighteen children and a mom to baptize, it was quite a crowd. Once everyone had assembled, they were asked questions and the congregation recited the Apostle’s Creed in Nuer. Pastor John baptized about half of the children and I baptized the other half. In English and Nuer, we said the words, “I baptize you in the name of the Father and the Son and the Holy Spirit,” with water dripping down foreheads and bright eyes looking up at us. It was an honor to be a part of the service and to be present to welcome nineteen new brothers and sisters in Christ. I love the way cultural and language barriers are broken down and with simple words and water, we are united as brothers and sisters in Christ, made one by the power of the Holy Spirit. Later that afternoon, I participated in service #3 of the day with the Dinka congregation. At the beginning of the service, they sang “Christ the Lord is Risen Today” in Dinka. It was so neat to hear the familiar melody and have a sense of what was being sung, even though the only word I understood was alleluia! They sang and sang and sang, celebrating the resurrection promise in Dinka, Arabic, and English. After the service, Pastor Ayad invited me to join them for dinner. By that point, I HAD to get home and get my feet up, but he insisted I at least come at “eat with my eyes.” The Guild Hall tables were set with take out containers and the banquet table was covered with huge pots that held several different types of meat. They sent a box home with me and Justin was delighted to find that there was even a tripe dish! I love that it is my job to join in worship with brothers and sisters in Christ. This was an Easter to remember, filled with hope and promise. It was clear throughout the day that, even though we so often feel that we are walking in darkness, our faith and hope are in Christ, and in Christ there is light and life. We cling to the resurrection promise, no matter where we come from. Because Christ lives, we live, and we are united in that promise, here in Cairo and throughout the world. I certainly did not set out to do this, but through pure coincidence in the past week or so, I’ve been reading a lot about caves. The most recent New Yorker had an article about exploration of very deep caves and in her new book, Learning to Walk in the Dark, Barbara Brown Taylor works up the courage to enter into a wild cave and spends some time sitting in the deep, deep darkness that one experiences inside the earth. Last summer, when Justin and I visited Wind Cave in the Black Hills of South Dakota, at one point in the tour, the guide turned out the light and we experienced a darkness that I have never experienced anywhere else. It was so dark that we could not see our hands when we put them on our noses. No metaphorical darkness there. It was pitch black. Though John doesn’t include this detail in his Passion Narrative, Matthew, Mark, and Luke do. From noon until three, darkness covered the whole land. Darkness covered the whole land. Not metaphorical darkness, although that certainly filled the hearts of those who stood by to watch Jesus die, but real darkness, covering the land while the Savior hung on the cross to die. There is darkness about this day. It is solemn and somber. It seems funny to me when Good Friday dawns bright and sunny (as it has on this 90+ degree Cairo day). It should be rainy and dreary and dark. This is the day when we remember that our Lord died. Really truly died. Breathed his last. Bowed his head and gave up his spirit. It is a dark day, and though we know that the story is not yet finished, still, our hearts are heavy on this day. There is darkness covering the land today, on this strange paradoxical day we call Good. Darkness of violence and uncertainty, darkness of illness and unemployment. Darkness of despair and hopelessness. Darkness that comes along with waiting for word from family and friends stuck in the middle of fighting in South Sudan. Darkness that comes with not knowing whether your three missing nephews are alive or dead, as is the case of one of our South Sudanese friends. And though the sun shines this morning, there is darkness in our hearts. The kind that comes from fear and dread and grief. The kind that comes with facing our own mortality, even as we contemplate the death of our Lord. Sometimes it feels as though this darkness cannot, and will not, go away. Cannot and will not give way to light. There is darkness, if not literally, certainly metaphorically, in our hearts and in our world. We have a God who dies. This is a central tenant of our faith. One that many find strange and weird and heretical. But, as Christians, we believe that God takes on human form, really truly human form, and God dies. And though we know that this story is not yet over, for today, we sit in the darkness, in the shadow of the cross, bearing witness to the darkness and despair that are so very real in our lives and in this world. And God promises to meet us there. At the end of the day, after Jesus had declared, “it is finished,” and bowed his head and breathed his last, Joseph of Arimethea and Nicodemus, who had first come by night, take Jesus’ body and laid it in a fresh tomb. It’s quite likely that that tomb was a cave. We learn from the other Gospels that it was sealed with a stone. Jesus’ dead body was laid in a dark tomb, one that matched the darkness that filled the hearts of his disciples and those brave followers who had stood by to watch him die. Though we sit in the shadow of the cross, in the darkness of this day, we live in the paradox, this in between place, where we grieve, and yet we know that new life can and will and does start right here, in the darkness of this day. Several weeks ago, I attended a funeral for the husband of one of the members of the Nuer congregation. Pastor John came into my office a few days before and told me there would be a funeral on Sunday afternoon for this man who had died in South Sudan. While the fighting continues in South Sudan and many members have lost loved ones, or are waiting to hear from them, my first thought went to that. It turns out that he died from natural causes related to high blood pressure, which is still very sad. Death is sad, no matter the circumstances. His wife is one of the women who regularly attends the Bible study, and one of the first women I met when I started working with the Nuer women. She has a wonderful sense of humor and is fiercely proud of her eight children. When the day of the funeral came, she sat in the front row, with tears running down her cheeks and her shoulders slumped. There were several eulogies and a powerful sermon. All through these, she cried and cried. And then the youth choir came forward to sing. I don’t remember the words exactly, but they were something along the lines of “At the name of Jesus, there will be life.” And there was life, indeed. It wasn’t long before she was standing up, with a huge smile across her face, singing along and dancing with the members of the community who were moved by the Spirit at work through the song of their children. I felt like I was watching resurrection play out right in front of me. Her grief was still raw and real, but the hope that she clings to was resurrected and made plainly clear before her, and before the packed congregation of people–from several tribes and congregations–who had come to pay their respects and show their support for her. I think it’s significant that after Jesus calls Lazarus by name to come out, and even after Lazarus does indeed hear Jesus’ voice and come out (note the similarity of action to Jesus’ promises in the previous chapter), the miracle – or, in John, sign – is not over. For after commanding Lazarus to come out of the tomb, Jesus then turns and issues a command to the waiting crowd as well: ‘unbind him and let him go.’ The community, in other words, is commanded to participate in God’s action, to bring it to its desired end and outcome, to join in completing God’s redemptive act. Yes, the raising of Lazarus from death to new life is entirely Jesus’ work, and yet Jesus invites the community to participate; that is, to do something, something essential and meaningful and important. There is no question that the promise of resurrection was clear in the eulogies and in the sermon that day. Jesus’ promise to raise James, and all of us, from death to life was clear and that message was proclaimed loudly and clearly. But it was also clear that day that the community–particularly in the form of twenty or so 8-18 year olds and the gathered community who joined in their singing–was invited to participate and what they did was essential, meaningful, and important, not just for the grieving wife, but for this pastor, and for all who gathered that day. Grief is still real and raw. But the promise of resurrection, along with the work of a community coming together to do the important work of lifting up and supporting those who grieve, was also very real that day. It’s the strange paradox of the promise of resurrection in Christ. It’s the strange paradox we’re preparing to proclaim in just a few short weeks. Death will not and does not get the final say. The last word is life, proclaimed in Jesus’ name. PS The meal served after the funeral was fried chicken. It was delicious. It turns out that comfort food is comfort food. And there’s grace in that, too. I’ve been thinking a lot this week about the beatitude, “Blessed are the peacemakers, for they shall be called children of God.” I don’t think it should come as any surprise why this particular blessing stands out among the list we’ll hear in churches around the world this weekend. Cairo saw a surge in violence over the weekend as Egyptians remembered the 3rd anniversary of the beginning of the revolution. Our brothers and sisters from South Sudan anxiously await news from family and friends still in the country. One friend has missing twelve-year-old nephews, a few others have heard confirmation that family members or close friends have been killed in the violence there. We long for peace and pray for it, for Egypt, South Sudan, Syria, and so many places around the world. We need peace makers. I’ve been working my way through the book The Sacrifice of Africa: A Political Theology for Africa, after I learned about Maggy Barankitse and Maison Shalom. Several stories of peacemakers throughout Africa are told in the book, and after reading Bishop Paride Taban’s story, I’ve been doing a little more research about him. He started the Holy Trinity Peace Village in Kuron, South Sudan, after seeing Neve Shalom in Jerusalem, where Christians, Muslims, and Jews live together in harmony. “Wow!” he recalls in an interview, “I will retire from the administration of the diocese and start the peace village as soon as the peace is signed.” Now, members of several tribes live, play, and learn together in peace and harmony that was previously unheard of. While young men had previously stolen cattle from neighboring tribes, these former cattle raiders now play football together. Today, I watched as young men played football (soccer) in the makeshift pitch that we usually call the courtyard. The youngest is probably 10, a bright young man whose smile lights up the room and who grew about 4 inches over the Christmas break. I watched as he made a fantastic header, impressing even the coolest older boys. The young men come from Somalia, Eritrea, and South Sudan. And while the competition is fierce, the laughter is contagious. Younger students gathered around watching. It becomes a community event when they play after lunch. I’ve learned that dodging footballs can become a means of grace. I know I’ve said it before, but it’s so true. I see hope in the courtyard pitch. I see hope in the faces of these young people, taking a break from their learning to play. And I wonder, maybe there’s something to it, blessed are the playmakers. Maybe the world has something to learn from these young men who come from so many places, whose stories could go so many ways, and yet, find themselves together in our little courtyard, laughing and playing. From the former cattle raiders who let the cattle be so they can play football instead. Blessed are the playmakers…for in their play, we see glimpses of peace. In my humble opinion, one of the greatest gifts a congregation gives a pastor is the gift of looking out on their candle lit faces on Christmas Eve, while singing “Silent Night.” And St. Andrew’s delivered that gift. Twice. The first service of Christmas Eve was a pretty familiar service for me. Lessons and carols. All of the American favorites–“O Little Town of Bethlehem,” “Angels We Have Heard on High,” even “The Little Drummer Boy.” One of the children in the congregation, who recently turned nine, sang, in that beautiful, clear boy soprano “Once in Royal David’s City.” Gloria, the Filipina who is St. Andrew’s number one cheerleader and meal planner extraordinaire, sang a medley of Filipino Christmas songs. The readers were Egyptian and American. A young woman who just arrived from South Korea played her violin. When it came time for communion, I stood next to my ELCA colleague, a professor at the seminary, and placed bread into the outstretched hands of the people I have grown to love so dearly over the past four months. From Indonesia, the Philippines, South Sudan, South Korea, and the United States. From a whole variety of denominational backgrounds. Coming together to celebrate that good news of great joy for all the people. While we worshipped in the sanctuary, the Ethiopian congregation, worshipping in Amharic, met in the one of the classrooms for their regular Tuesday evening worship. Good news of great joy for all the people. At the end of the service, I read John 1:1-14 and the ushers started lighting candles. They were brand newly made and took awhile to light. Apparently the message to turn off the lights while I read had not been delivered and, even though I read pretty slowly, the candles were only about half lit when I finished reading. I stepped from the lectern to turn off the light closest to me (the switches line the wall of the old building) and a number of people took the cues to turn off the ones closest to them. Soon, the candles were lit and the organist started to play. It was perfect. As I looked out over these candlelit faces, I saw a vision of the body of Christ, in all of its quirkiness. There were at least four other ordained pastors there that night, someone who may eventually go to law school, an diplomat and his family, an American family living in Germany who were visiting Cairo over the Christmas break. People who work as electricians and cleaners. Professors, teachers, students. People who ask for prayers that they might find work soon. The church guard had gone to get the woman who cleans the Guild Hall on Fridays and on special occasions, and they stood in the back with their candles lighting their faces. We are an unlikely band of brothers and sisters, brought together by the one whose birth we celebrated that night. We ended with “Joy to the World,” and it seemed totally appropriate that we sing that joyful tune, remembering that God-with-us has indeed come for this whole wide world. Gloria made sure that none of us would go hungry and there was quite the banquet spread out for us in the Guild Hall after the service. As usual, there were conversations in at least two languages, and we enjoyed traditional food from many places. There was even a turkey. But the night was still young. The Nuer congregation had invited us to their worship service, which was to include 32 baptisms. They told me to go ahead and eat and visit and if it got to be time for me to come, someone would come and find me. I walked in about half way through the baptisms and saw a whole bunch of people gathered around the old stone font. Parents and children, two women’s elders proudly standing next to the pastor to lift up the little ones. As assisting minister read the names and helped corral all the children. It was a little bit chaotic, yet so very holy. The pastors had asked me to participate in the baptisms, and soon it was my turn. I looked into the shining eyes of mothers, and the sleepy eyes of more than one little child. The water was warm as I poured it over their heads, “In the name of the Father, and of the Son, and of the Holy Spirit,” and traced that cross on their foreheads, “You have been sealed by the Holy Spirit and marked with the cross of Christ forever.” Brothers and sisters in Christ, named and claimed in the waters of baptism. There was joy in the air we finished the baptisms and the congregation welcomed the newly baptized with their special clap: clap-clap-clap, clap-clap-clap, clap-clap-clap. A couple of women ululated. Mothers beamed and a few stirred in their mothers arms, having fallen back to sleep after the water had been poured over their heads. And then it was time to sing. Someone handed the keyboard player a song book and stood over him with a candle. The pastors stood at the lectern and looked out over their congregation. Ushers made sure everyone had candles and turned out the lights. A few even lit sparklers. It was a totally different “Silent Night,” upbeat, a different melody, the drummer beat steadily on the oil can drum. And, for the second time that night, I tried not to let the tears spill out over my cheeks. And then there was Christmas Day. If you’ve been following the news from South Sudan, you’ll understand why I will treasure Christmas Day 2013 for a very long time. 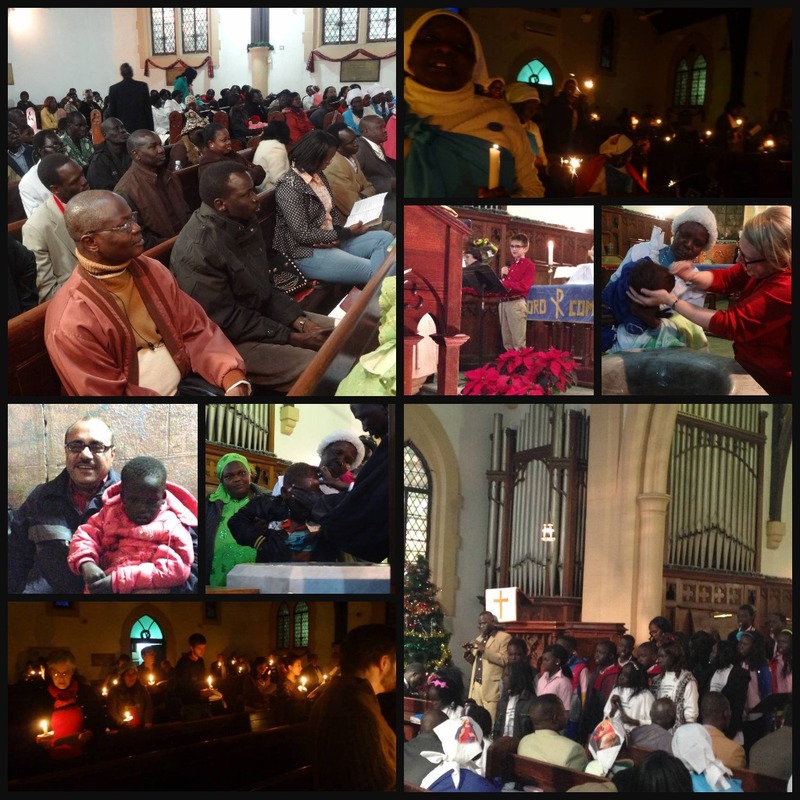 Even while Nuer and Dinka in South Sudan fight and kill one another, the two communities in Cairo, as well as the Sudanese Lutheran congregation that worships at St. Andrew’s, and representatives from the Shilluk congregation that worships elsewhere in the city, came together for worship on Christmas Day. In Arabic and English, Nuer, Dinka, and Shilluk, we prayed and sang and came together at the Lord’s Table. For those three and a half hours, differences were set aside and prayers were lifted up, together, in thanksgiving and celebration. Prayers were lifted up for peace, in South Sudan and Syria and throughout the world. There was lots of music. The song leader would begin to sing, and soon voices were raised throughout the sanctuary, not just by one group, but by the whole congregation. Even at the point in the different congregations sang a special song, everyone joined in. Women danced in the aisles and voices were raised throughout the old, dusty sanctuary, decorated in its Christmas finest. We were welcomed at the Lord’s Table and came forward with outstretched hands, each fed with the bread of life, regardless of where we came from or what marks might other wise distinguish us. The Spirit moved among us and did not distinguish us by tribe or language, but called us together as brothers and sisters in Christ and made us witnesses of the good news of great joy for all the people. The good news of great joy that brought us together. The good news of great joy that takes strangers and enemies and calls them brothers and sisters. On Christmas Day, I looked out over this congregation that the world news would lead us to believe shouldn’t be together. Couldn’t be together. And yet we were. In peace and joy and celebration. I was struck by the promise of incarnation. By the promise that we celebrate on Christmas–that God comes to us. That God comes, not as the mighty and powerful warrior, but as the humble and vulnerable child. And then continues to breathe life and hope and promise into the lives of people, even with all of the baggage that we bring. With all of the joys and sorrows that we bear. With all of the struggles we face. That God continues to come to us, God’s beloved people, is worth remembering and celebrating, not just on Christmas, but always. It is indeed good news of great joy for all the people. And light that shines in the darkness. From the night you were born, from that very first picture we saw, of you on the scale, your face red and your mouth wide open, wailing at the surprise of being out in the world, your Uncle Justin and I loved you so much. We kept looking at that picture, with huge smiles, and tears running down our cheeks, so excited and so much in love with you, our Number One nephew. We met you for the first time when you were six weeks old. I love the picture of your Uncle Justin looking down at you, sleeping, in your stroller. We loved you before we had even met you, but when we finally got to hold you, we were smitten. I know that I would do practically anything to make sure that you are safe in the world. Your Uncle Justin would do the same. We, along with your parents and grandparents, and all of the people who love you so much, want to make sure that you have what you need to be safe, to be warm, to be fed. At the end of the day, I think that’s what most parents (and godparents, too!) want–for their children to be safe, warm, and fed. For them to grow up healthy and strong. For them to be free to be the people God calls them to be. To live in a peaceful world, where kids don’t go to bed at night hungry or afraid. I hope that, as you grow, you will know that your Uncle Justin and I hope so much for you to live in a world that is better than the one we live. And we hope that the work that we do helps to contribute to that–a better world–for kids here in Egypt, but also in South Sudan, and the United States, and in so many places around the world. While you’ve been visiting Mimi and Papa in Indiana, Mimi and your mom have sent us lots of funny pictures, and a few videos, of you playing in the snow, and reading with Papa, and feeding yourself spaghetti at La Cucina. You have grown so much in the past 20 months and you don’t like to sit still for very long anymore. But when you were a little, tiny baby, that first time we met you, you could barely hold up your head. Uncle Justin hadn’t spent much time around babies, and we had to remind him to support your head. Because even though you’d try to hold it up by yourself, you weren’t strong enough yet to hold it up for very long, and it would come crashing down on our shoulders, or if we were really unlucky, our chins. Your mom and dad had to do everything for you, and we tried to help however we could while we visited, including babysitting for you while your mom and dad went out to dinner without you for the first time since you were born. You were really good at eating, and crying, and sleeping, and yes, pooping, but you needed someone to feed you, and burp you, and change your diaper. You, like all babies, were completely helpless. You needed other people to help you, to take care of you, and to help you grow. As you grow, I hope you will learn all kinds of names for God. Rock, I am, Good Shepherd. Wonderful counselor, almighty God. Prince of Peace. But, maybe most of all, I hope that you will know this one. “God with us.” For me, that is the promise of Christmas all wrapped up into three little words. “God with us”–Emmanuel–came into this world, just like you did, as a tiny little baby who was completely reliant upon the people who loved him. The people who cradled his head so that he wouldn’t come crashing into their chins. The people who looked down at him and would have given anything to make sure that the world he lived in was safe and peaceful. People didn’t expect God to come that way. They expected that God-with-us would be powerful. That he would be a mighty, strong, and brave warrior. That he would punish his enemies and come with vengeance. But one of the things I love about reading the Bible is seeing all of the stories about God surprising people. Like when he surprised Abraham and Sarah with a baby, even though they were really old. The way he helped the Israelites find a way out of the slavery in Egypt, and then surprised them with manna in the wilderness so they would have something to eat. The way he helped Shadrach, Meshach, and Abednego out of the fiery furnace, and Daniel out of the lion’s den. The story of Jonah trying to get away, and then ending up in the belly of a great, big fish. There are so many stories of God surprising people and also so many ways that God tried to get people to understand that God’s mission is mercy, grace, and love. That God’s vision is about making sure that the people who are hungry have food, and that God’s creation is taken care of, and that the people who are sick are healed. That all of God’s people would live in a safe world and that they would know peace, down to the depths of their bones. So when Jesus comes, not as the mighty warrior, but as the helpless, little baby, its no wonder that people were surprised. I’m still surprised that God would choose to come into the world this way. When we remember that God came just like you did, I wonder what would happen if we thought about the feelings that are stirred up inside of us when we hold little babies, that deep, deep love, but also that deep, deep desire for peace. What would happen if we remembered that God came into the world that way? If we worked toward guaranteeing that the world you grow up in is better than the world we live in right now. And not just you, but kids in Egypt, South Sudan and Sudan. In Somalia, Ethiopia, and Eritrea. In the Philippines and Indonesia and Nigeria and the United Staes and throughout the whole world. When I was in seminary, studying to become a pastor, I had a really wise, old professor named Dr. Klein. He taught us about the Old Testament and he was so smart that he could read his Bible in Hebrew and translate it on the spot for us. When he talked about Isaiah, chapter 7, where Isaiah tells King Ahaz to look for a sign–a little baby–who will be called Immanuel, Dr. Klein said to us, “It is a challenge that God is with us–look what God with us did! He challenged us to take care of the people who are hard to care for, he challenged us to be servants, he challenged us to give up everything to follow him.” And then he reminded us that God loves us so deeply that God hopes that we will be transformed. I don’t know what you will grow up to be. But I hope that, as you grow, you will pay attention to the people around you who need a little extra love. That you will be kind to the people who are hard to love. That you won’t stop noticing the people on the streets of New York who are hungry or sick or really, really poor. That there will be something stirring inside of you that will work toward making a difference in the world.